The FT14-F is ball float steam trap having stainless steel working internals and integral automatic air venting facility. The FT14-F can be maintained without disturbing the pipework. Flanged EN 1092 PN16, ANSI 150 and JIS/KS 10. 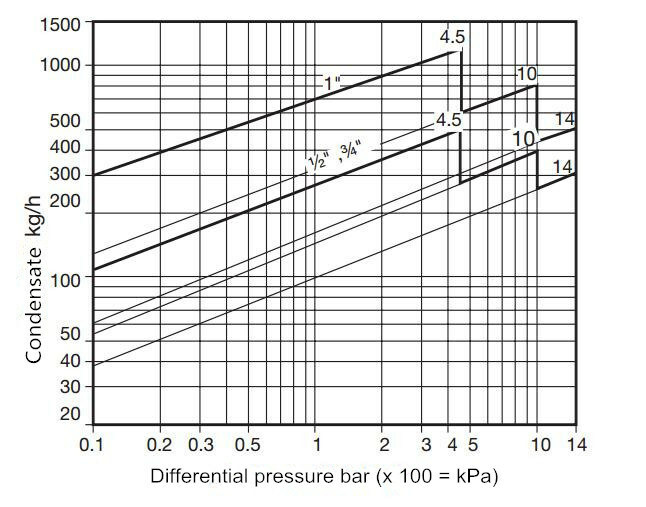 Capacities shown above are based on condensate at saturation temperature. When discharging sub-cooled condensate the air vent provides extra capacity. Under start-up conditions when the condensate is cold the internal thermostatic air vent will be open and provides additional capacity to the main valve. On 4.5 bar units this will provide a minimum of 50% increased capacity above the hot condensate figures shown. On 10 and 14 bar units this will be a minimum increase of 100% on the published capacity. The above table gives the minimum additional cold water capacities from the air vent.